KJIPUKTUK (Halifax) – Last evening’s founding meeting of Equity Watch was successful beyond her wildest expectations, Halifax writer and activist Judy Haiven tells the Nova Scotia Advocate. Equity Watch is a new organization that aims to call out public and private employers who refuse to stamp out bullying, misogyny and systemic discrimination in their workplaces. Reporters had been asked not to attend the meeting so that people would feel secure and be able to speak freely. Almost all who attended were women, says Haiven. The organization will not turn anybody away, but its focus will be on women and members of marginalized groups that are frequently subjected to systemic discrimination. “People who came were mostly delighted and relieved that they were getting some backing and that together we can move forward. Some of these people have already had a lot of media coverage. But on your own it is a very lonely and difficult road,” Haiven says. A clear pattern emerged from the stories people shared at the meeting, Haiven observes. Rather than being supportive of these workers Human Resources departments are among the biggest culprits, Haiven adds. Haiven gives a lot of credit to former firefighter Liane Tessier, who recently received an apology from the Halifax fire chief for blocking promotions and not shielding her from bullying by fellow workers and management types. Tessier is the co-founder of Equity Watch. Equity Watch believes the Human Rights Commission is more interested in settling cases than tackling injustices fundamentally. Monitoring the Commission is very much part of the group’s mandate, says Haiven. Not just the Human Rights Commission, unions as well have at times abandoned these workers, Haiven adds. There will be a follow up meeting of Equity Watch in a few weeks. Previous Post Letter: Glaze report – Simple answers to complex situations? All I have to say is this. I want so much to help you in bringing awareness to your most important work. You see, I am a Registered Nurse who spoke up about bullying and harassment in June 2011 and for the next 5 years I was retaliated against, by my boss and her followers in the most excruciating, disloyal way by my employer NSHA who along with NSGEU flatly refused to do anything to help me but sided with the bullies, hiding and sweeping everything under the carpet. The end result was driving me to the brink of insanity in which I was diagnosed with PTSD and severe depression, at home on leave when my tormentors continued to cyber bully me in which I lashed out on my own facebook page (after I deleted all friends so no one could see except my abusers) who stalked me. Systemic abuse in my case involves not just my employer but the union and a regulatory body of nurses. My case now is sitting at the Nova Scotia Human Rights Commission and Nova Scotia Labour Board. I am waiting to see what they will do as to this date, no one in either Liberal or Conservative Government has acknowledged me. I also have had a 3rd party investigator involved in my case in which it was “demanded STOPPED” by the college CRNNS once everything was being revealed what took place behind closed doors regarding myself and who were all involved, including my boss, Human Resources, Occupational Health & Safety and even my own private psychologist. I was sent to an “independent psychologist” used by my employer then had my “confidential” OH&S file sent to this psychologist (without my knowledge) then wrongly diagnosed, labelled and discriminated against and then OH&S faxed my “confidential” psychological report into the hands of my boss, whom I filed a complaint against. I have all the “concrete” proof prepared by the 3rd party investigator, and no one, including the union and college will acknowledge what I went through. I have had this information for two years, patiently hoping someone will listen. I was pushed to “one day” before my “time limit” was up before I was considered by the Labour Board and Nova Scotia Human Rights Commission for an extension to hear my complaint. No promises to be heard though. Still waiting. Hi Lynn, Would love to speak with you sometime. I have been through a similiar experience. If you are reading this, please send me an email at letloveandreasonunite@hotmail.com. I wish these women every success in exposing – and, eventually stopping – all abuses toward women. I just heard the CBC radio interview, and am deeply pleased. I hope to attend your future meetings. All the best! This is just an update. 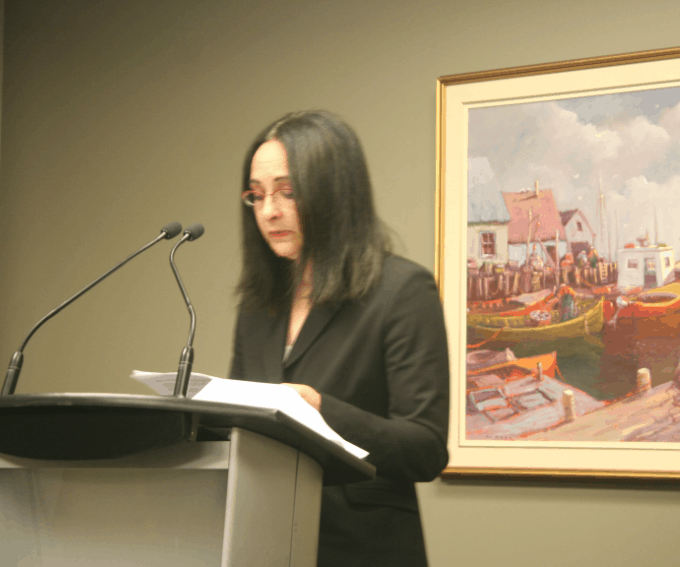 The Nova Scotia Human Rights Commission has agreed to proceed forward with my complaint. I so much want to contribute to your most important cause for every Nova Scotian in such a horrifying predicament. Also, I would like to say that it was my EAP counsellor back in June 2011 who was the one person who gave me hope and encouragement and truly believed in me. He/she is forever in my prayers. wow, no one else is speaking out? I just recently found out that Global News is shutting down in this Province!? They were the only news channel to speak on global issues as well as here within our Nova Scotia Government. We are now “stuck” with “one” news agency CTV. What is going on here in Nova Scotia? Can someone find out? I sure hope the MacNeil Government did not drive them out. I am leary of Government controlled media. Government do not like being “held accountable” for any wrongdoings. Something is very wrong here in Nova Scotia. We have been a society of secrecy for centuries. We are a little old isolated province where corruption was allowed to flourish. Just look at the “Butter Box Babies” in Chester and the book “A Century of Care” A history of the Victoria General Hospital in Halifax 1887-1987. or read the book “The Druggist of Auschwitz”. You see, people are unaware of what type of “personality disorders” are behind “abuse” in general, whether it be psychological, emotional or physical. Our society, in my opinion, protects the “abusers”. I would like to put our Mental Health Care System in Nova Scotia on “notice”. Wow, I have read that book. It so describes what true corruption is all about. The scary part is that it was government organized. It was a planned execution of human life and people even in the profession of healthcare participated with actual nurses taking victims to the gas chambers. Have to say, I as a nurse would never in my mind conform to their evil ways. I just would have refused! We have to understand that there are good and bad in every profession and every walk of life. OK, everyone is afraid to speak out. I do not blame you. It takes everything from you to speak out. Fear is always in your gut. Anxiety always at your side. What can I do you say? I am nothing because they all made me feel like nothing. I, myself have great respect for me and everyone around me. In my battle against “bullying and harassment” in the workplace I had an “army” against me. Because of the fact, that I do believe in myself, I decided to “trudge” along. You see, I was approved for LTD (I by-passed the union and sent all my documents to them); but I feel more humiliated that I had to protect myself with no help from my union). LTD is not fun. You have to get regular check-ups to see if you are “capable” to do any job besides your own chosen career. That to me, is an insult! I chose nursing because I cared about people, not because it paid me more money. I used to work as a secretary, for half the salary, but I then loved my job. I truly am a good person destroyed by systems of “status quo”, “well everyone lies”, “you will never change people who crave money”. I remember at 4 years old having compassion, worry about my grandpa being alone. Through the course of my life to this point at 62 years old, what I have witnessed both in the administrative field and healthcare and also the legal system; well, I must tell you all, I lost all faith in humanity. I believe everyone is profiting off other people’s problems. Just look at everything: Police profit off of Criminals; Healthcare profits off of Sickness; CPS profit off of unfortunate families and poverty; Psychologists/Psychiatristis profit off “mental illness”; Lawyers profit off every ones’s “problems” and Government “profit” off “the people” who are manipulated and used. So, who do you think are honest in this whole bunch of people. Equity Watch Nova Scotia is one step, a baby step, in trying to make good in the world. Please everyone, please “speak out”. I have to reply to my own post here. When I speak about all Government Agencies who profit off peoples’ problems, I only meant those who are only in that profession for the “money” not for the “love of their job” or “truly wanting to help those less fortunate”. We have many, many caring, compassionate human beings working in every single profession, job known to man. The world cannot exist if we did not have “Sanitary Workers, Minimum Wage Workers, and every single person out there contributing to our society. Especially Volunteers who give their love and time to help others. So, thank God, it is a minority of “bad apples” in every job but those few “bad apples” can literally spread like cancer throughout an organization or job site if allowed to. If we could only put a STOP to these few “bad apples” then I believe people would not be so “frightened” to go to work. If we stand back and just watch them destroy without doing anything about it then we are considered “part of the problem”. Bless all with the “courage and strength” to keep “speaking out”. Well what should I say? People in Nova Scotia are “afraid” to speak out. Nova Scotia has suppressed people for so long they continue to get away with a culture of “impunity”. I know Sheldon MacLeod is trying to get people to speak out. I listen to him every single day. He and all of his guests know we have a problem with speaking out in Nova Scotia. Journalists are even “shut down”. So who do we have to speak for us? Lawyers won’t! They are embedded with whoever pays the most “money”! So where can we go? How can we get someone in authority who is not corrupt? Please tell me? Where can we speak to a person in ‘AUTHORITY’ WHO GIVES A DAMB? someone who would advocate for my right to return to work and allow me to have the necessary support giving my condition, I could become retaliated against. I returned to work only to be escorted into a meeting and told not to speak about other issues such assexual harassment i had witnessed along with the bullying I suffered at the hands of a former Manager. I had left the meeting that morning and was to inform my physican of what took place during that meeting. My employer then had involved the police. I had a police officer come by my sister’s house and threaten me. I was asked to meet down a dark pathway to insure that I have no weapons. I was then recommend by my employer to speak with two other psychologist who then had to explaine to my employer that I was not insane and that it would be helpful for my physiological condition if I were to be given written communication from my employer if any other meetings were to take place in the future allowing me to have the necessary support going into such. I again received another phone call from my employer coaching me to take part in a meeting but not allowing me to be supported. The NSGEU, Nova Scotia Human Rights Commission, Department of Labour, LTD Insurance provider, all no support. I had been asked to file a Human Rights complaint after all law firms I spoke with explained to me that they would have a conflict of interest. while later getting support to inquire about my complaint, It had been conveyed to us that they had misplaced my complaint. I’ve suffered too long in silence. I now practice OH&S as my trade and would like to see the issue surrounding diversity and inclusion delt with in the workplace. If you have a disability you should be allowed the necessary support for your condition regardless of NDA. Oh my dear God, bless your heart. I am covered with goosebumps! Your post is “exactly” my story. I was so tortured after being retalliated against for “speaking up” against a “hostile environment”, and bullying and harassment that I ended up with C-PTSD. In my case, OH&S, HR, more than one Manager, NSGEU (three different EROs) and their lawyers (two), CRNNS and their “unethical” private psychologist, NSHA and their “unethical” private psychologist, NSHA Psychiatrist, my own “private” psychologist at the time, the EASE program..all had a part in my demise of my beloved job as a Registered Nurse and in the end my whole “career”! This is the extent they will take to “get rid of an employee who dares speak out against violence in our workplace” and this is our healthcare system here in Nova Scotia. It also goes on in every other profession. You wonder why we have no doctors and emergency rooms are closing due to no staff! Dr. Gabriel Horne fought 15 years in her case. The scariest part of all in my case is that it was a 3rd party investigator which revealed everything that went on behind my back and I have had those documents for two years now and no one, including lawyers for NSGEU will look at them. You see, they refuse because a lot of people will be held “accountable”. My case is with the Human Rights Commission right now and if they refuse to look at my “3rd party documents” then I guess we can say our whole Province is corrupt. I am holding out “faith” as this is too important to many, many, many “suffering” people. This is definitely not just about “me”; this is about every single human being out there who needs to be “heard, listened to and treated fairly”.